So, four Witches? Is this a Star Wars dark lord of Sith-type limitation on the number of Witches? Let’s explore this witch-rule across three different versions of Oz – canonical Oz, by L. Frank Baum; Disney Oz, coming to theaters soon; and The Hidden History of Oz, available now. You may have seen what Disney is doing with their Oz prequel, Oz, the Great and Powerful. If not, here’s a quick peek at one of the TV spots. Glinda – Glinda is a good witch who rules over a peaceful kingdom of simple, kind folk. Beautiful Glinda is not only a compassionate and benevolent witch, but also a fierce protector of her people. Though Glinda sees through Oz’s facade early on, she knows genuine goodness lies within and helps Oz achieve his true destiny. Evanora – A witch to be feared, Evanora is Theodora’s over-protective sister. With her penetrating gaze, she exudes a powerful presence and has positioned herself as the royal advisor and protector of Emerald City. Theodora – Theodora is a beautiful, naive witch who is protected by her powerful sister Evanora. Theodora only wants peace to come to the Land of Oz and truly believes that a prophesied wizard will arrive someday to restore order. Then there is a silhouette of a witch in the fire. Who could this be? We’ll have to wait until March 8, 2013, when the film is released, to find out. The Good Witch of the North was not named in The Wonderful Wizard of Oz. Nor whas she named in any of Baum’s Oz books. However, Baum gave her the name of Locasta in the 1902 musical extravaganza, The Wizard of Oz. 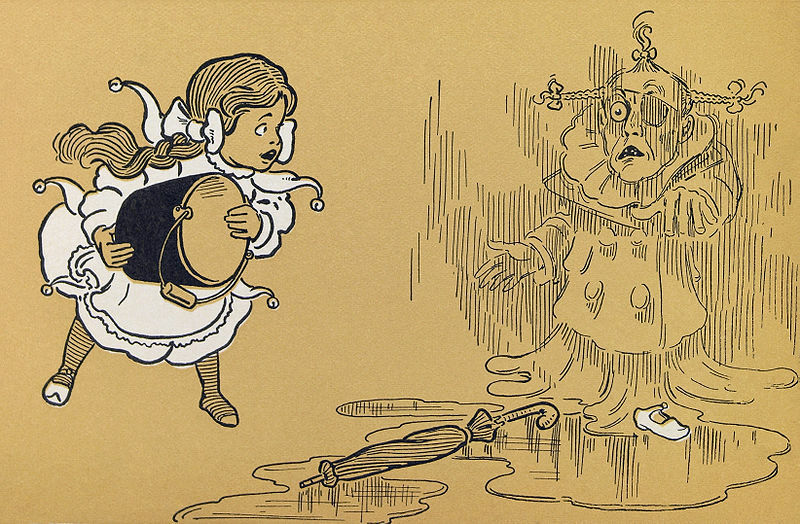 Ruth Plumly Thompson, Baum’s handpicked successor in writing Oz books, revamped the character and gave her the name of Tattypoo. The Good Witch of the North is often confused with Glinda. Why? Because the 1939 MGM movie, The Wizard of Oz, combined the two good witches into one and called her Glinda. Thanks for that. The Wicked Witch of the East is not named in Baum’s books. The Wicked Witch of the West is not named in Baum’s books. However, in the 1910 silent film, The Wonderful Wizard of Oz, this witch is named Momba in the intertitles (or title cards). So she was the most beautiful of the four witches. Later books in Baum’s Oz series refer to Glinda as a Sorceress, rather than a Witch. This information is taken from The Hidden History of Oz, Book One: The Witch Queens. Gayelette is the eternal sorceress who rules from the Ruby Palace in the lands of the North. She is a sorceress who exists in a different time than normal people – she does not ever age. She is more than one hundred years old. Her constant research keeps her too busy to pay attention to either matters of state or family. Kalinya rules over the Munchkins in the East as their unquestioned leader. She is cruel and easily irritated. Her magic is telekinetic, and her greatest threat is to throw a person into the sky. She is clever and constantly schemes to gain more power, especially against her chief rival, Gayelette. It is Kalinya who later becomes known as the Wicked Witch of the East. Ondri-baba is the homely and cruel younger sister of Kalinya. She is short and stocky, and fond of wearing ornate neckpieces. Her magic is invisibility. She has a magic eye that can see long distances; it can see what normal waking eyes cannot see. She controls the majority of the magic hourglasses sold by Smith & Tinker, and so controls the Sandy Armies. It is Ondri-baba who eventually conquers the Winkies in the West and becomes the Wicked Witch of the West. Sonadia is only mentioned in the book. She met her untimely death under very mysterious circumstances. Through conversations with Kalinya and Glinda, we learn that Sonadia had powers over weather, and she taught some of these spells to Gayelette. Mombi is a strategist and political opportunist. Though her powers of transformation and disguise are well-known to the leaders of the various lands in Oz, Mombi seeks out the true positions of power – those behind the throne. She is careful in her use of power, though sometimes she gets caught up in Kalinya’s schemes. Note: Mombi is not mentioned in The Wonderful Wizard of Oz, though she is the primary antagonist in Baum’s second book, The Marvelous Land of Oz. Locasta is a young Munchkin maiden, taken as an apprentice by Kalinya, Witch of the East. She is quiet and non-confrontational, doing what she is told. She fears her master and the cruel punishments that she earns for her supposed ineptitude. Her most powerful magic is the ownership of an oracular hat. Though sent to capture Glinda, she learns a valuable lesson from the young sorceress and finds the courage to stand on her own merit. With Glinda building her forces in the South, Locasta becomes what Glinda cannot be – the Witch of the North. Glinda is the daughter of the Ruby Sorceress, Gayelette, and Quelala, rulers of the North. She was born a princess, but she imagines for herself adventure and romance, just like in her large collection of books. She has fiery red hair, and a temper to match. When her parents disappear, Glinda finds herself thrown into adventure, with the Wicked Witches chasing after her. With a name and a fame belonging to her mother, Glinda fights back against the witches to earn for herself the title of Glinda the Good, and secure a new home for herself in the South. According to Baum’s later Oz books, the witches had been ruling for decades, and the three witches – East, West, and Mombi in the North – conspired to conquer the entire Land of Oz and divide it up among themselves. According to stories in Book One, there have been two Witch Wars. Both of these wars tore the Land of Oz apart as the Witches combined their powers and created vast armies to fight against the kings and queens of the land. In the Second Witch War, the Witches obtained an alliance and power from the Queen of Dreams, a mysterious ruler from across the sea. The Witches unwisely used this power and poisoned and destroyed the sea. The sea became a toxic desert that surrounds the Land of Oz. Book One details the beginning of the Third Witch War, as the Wicked Witches again combine their power to overthrow the rulers of the land. While this book begins the Third Witch Wars, they do not end until later books, with the arrival of a young “sorceress” (Dorothy) to the Land of Oz. The Witch Wars end when all the Witches are dead. We know that Dorothy interacts with all of the main witches in the original story, The Wonderful Wizard of Oz. She destroys two of them, and receives magical protection and favors from the other two. However, the journey from four cardinal witches to two witches is a fascinating one explored in the Hidden History of Oz novels. If you haven’t picked up your copy yet, you can find it on Amazon (in paperback and Kindle versions) or on Smashwords. This entry was posted on January 27, 2013 by Tarl. It was filed under Witches of Oz and was tagged with four witches in Oz, Glinda the Good, Hidden History of Oz, L. Frank Baum, The Wonderful Wizard of Oz, Wicked Witch, Wicked Witch of the East, Wicked Witch of the West, Witch Wars, Wizard of Oz. Go. Watch/Read. Wicked. Go find out the truth with Elphaba and G(a)linda. And Nessarose. They are the three young girls, the three young innocent girls whose paths cross and who will grow up to be the Witches of Oz, two ‘Wicked’, one successful. And you might cry after that because it’s just too tragic and too big a misunderstanding. Thank you for the comment. The world created by Jeffery Maguire in the Wicked books is quite a different one than this author has created in The Hidden History of Oz series. By exploring the different worlds, you can find magical characters and stories that speak to you. If you choose to explore the Hidden History of Oz, there are some very interesting plots coming soon. Only baum’s and his successor’s books are canon. Wicked is basically fanfic that is primarily based on the MGM musical movie, which is in itself very different from the book. Awesome info! It kept me reading! But I still didn’t get who was the other good witch (Glinda’s sister). Thanks for reading, Erica. The other good Witch (of the North) is Locasta. Glinda does not have a sister in any of the stories listed. In the Hidden History stories, Locasta is a Munchkin girl who was chosen to be Kalinya’s (The Witch of the East) apprentice. The name Tattypoo is also referenced in the upcoming Book Three: Emerald Spectacles. Tattypoo means “Protector”. Check out the books for clear information about all the Witches. Thanks again for reading. WATCH WICKED! YOU WILL BE SUPRISED HOW AWESOME IT IS AND THE SONGS ARE AMAZING. ELPHABA IS OZMAZING, THE WIZARD US HIDIODEOS AND GLINDA IS PERFECTIFIED! AND THE SCARECROW IS KINDA HMM…….. HOT! Thank you for the scholastic answer(s). Oz is a very special part of my family. My Dad grew up with the books, he read them to me, and I read them all to my sons. New art is good but knowing the original stuff is important also.